We are starting to see a range of cool new 3D consumer cameras, like the Sony HDR-TD10 and the JVC GS-TD1, both great companion units to a GoPro 3D Hero setup. ;) The new Sony and JVC cameras record to a single 3D file in a Multiview Video Coding format (MVC) which is very cool, yet it currently has limited video editing compatibility. MVC simplifies the capture down to one video file for 3D, yet doesn't compromise resolution, like side-by-side 3D formats which squish the left and right view it one HD frame. 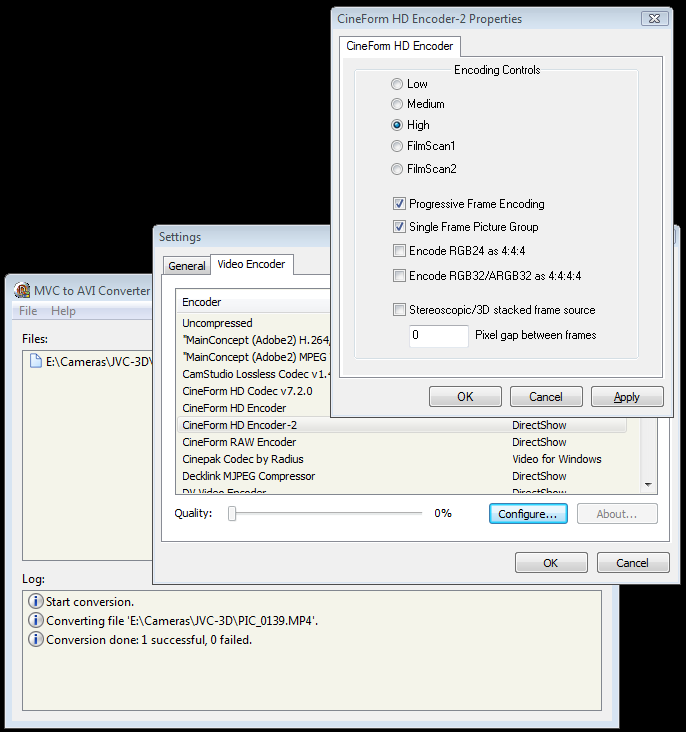 MVC stores two full frames of 1080 HD, not that unlike CineForm's own 3D format. For editing only Sony Vegas 10.0d has any native MVC support and currently only for the Sony camera. CineForm is planning conversion utilities for all common 3D sources, yet today there aren't any license-able MVC decoders available (we expect this to change soon.) At CineForm we develop our own compression technologies, yet license the standard based ones like MPEG2, H.264 and soon MVC. So what does a new MVC camera owner do in the meantime? 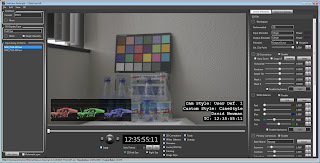 The output will be a left and right CineForm AVI files that can be quickly Muxed into a new CineForm 3D using FirstLight. While this is one more step, the muxing process is completely losses and very fast, as is simply adds left and right eye views into a new file without re-compression. With your new CineForm 3D AVI or MOV file, you can now edit 3D within common video editing tools, adding 3D corrections with key-framing within FirstLight. Please send me your youtube.com 3D link in the comments with you first successful use of this technique. 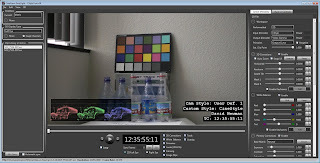 Curves - CineStyle and S-Log, a workflow choice. The tweets have coming fast with lots of recent activity around shooting curves, particular with the release of Technicolor's CineStyle (tm) profile for Canon DSLRs. I'm all for specialized encoding curves as I once helped developed the Log-90 curve used in the SI-2K (helped by Jason Rodriguez.) What Technicolor has done for Canon was a harder task, to squeeze the most out of an 8-bit heavily compressed H.264 for the best post correct-ability. For the basics on what these curves are doing, please check out my ridiculously long post 10-bit Log vs 12-bit Linear, or for a briefer coverage there is good info on this at prolost.com. In this blog entry I discuss what it might mean for your color correction workflow. 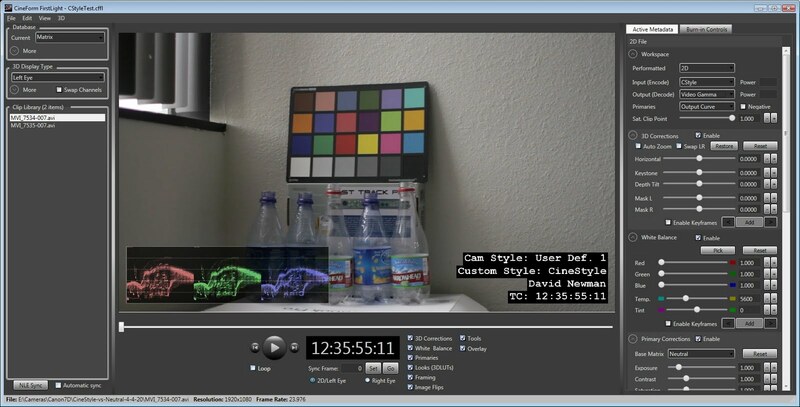 Consequences of applying color correction after the LUT. First note, the sample LUT is only 8-bit so if you want to do high-precision color correction (10-bit or greater), let's hope the CC tool being used is interpolating values between entries (we do this in FirstLight.) The bigger issue is the LUT contains flat spots, for which no detail can be extracted later, deep interpolation will not help. In the restoration of display contrast some values are flatten to black or white levels, so that post correction can't reveal the lost data. I wouldn't recommend color correction after or on top of the LUT, other than for minor corrections. Consequences of color correction before (or underneath) the LUT (or not using the LUT at all). While the 8-bit flat spotted output LUT would still seem bad, color correction and previewing the results through the LUT is still a fine solution. The 8-bit is not such an issue on final output, most displays and present formats are 8-bit -- you simply don't want to truncate to 8-bit before you have obtained the look your are after. A new issue arises, you are now color correcting upon a unknown (to most NLEs) non-standard curve. If your color tool has post corrections for exposure or white-balance (and some saturation tools) generally need to know what the source curve is, as these are linear light operations. To help illustrate this issue, here is the math for one stop exposure correction : Lifting a linear light grey level of 20% up one stop should become 40%. Each stop up is times two, and each stop down you divide by two. Yet with a wrong curve applied (such as not removing a 2.2 gamma used in this example) the same one stop shift would move 20% grey to 93%. Things can get messed up. White balance is also a linear-light gain upon R, G, B channels, so don't expect that Kelvin temperature slider to work the same as source with different curves. Now if you simply color correct until it looks good, who really cares if the math is wrong, after all this is a creative process not a lesson in the math of optics. To get an apparent exposure change will be tweaking gain and gamma control for approximately the same look. But if you want your color correction sliders to do what they say, and have a easier time in post, here is how CineForm does it in FirstLight and in the new (upcoming) GoPro CineForm Studio line of products. FirstLight has a control panel you many have never used called "Workspace". 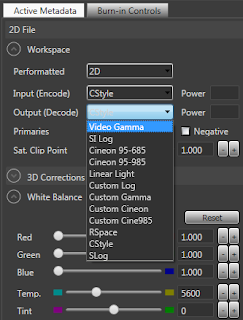 In the latest release of Mac and PC versions of Neo and Neo3D (v5.5.1) we have added CineStyle type curve ("CStyle") and Sony's S-Log curves for a current total of 12 different curve types. The defaults have the encode and decode curves set to "Video Gamma", this is correct for 99% of HD video source most users have been using. When you bring in a new CineStyle clip, default of Video Gamma is still set, but as this is only metadata you can change these parameters as you need. When changing both to "CStyle" the result is exactly as the source data looks, as shown in this screen grab. Side note: You can also see that the picture profile information is stored within the Canon metadata (which FirstLight can display) -- these tests were performed using a Canon 7D. While adding the metadata "CStyle" for encode and decode doesn't change the base image look, it now allows white-balance, exposure and saturation control to work correctly. There is no performance or quality impact to set this metadata correctly. As I'm sure you have many clips, and as this data is per clip information, you can simply copy and paste these metadata settings across all imported clips. 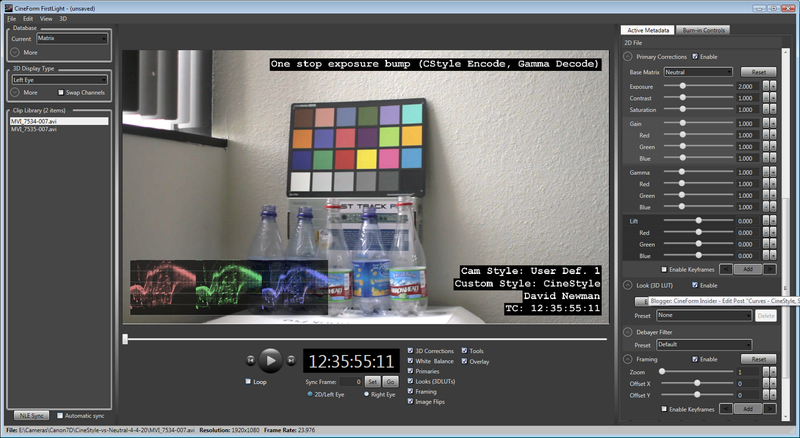 With your CStyle encode/decode set you can now freely color correct with or without the restoration LUT applied. 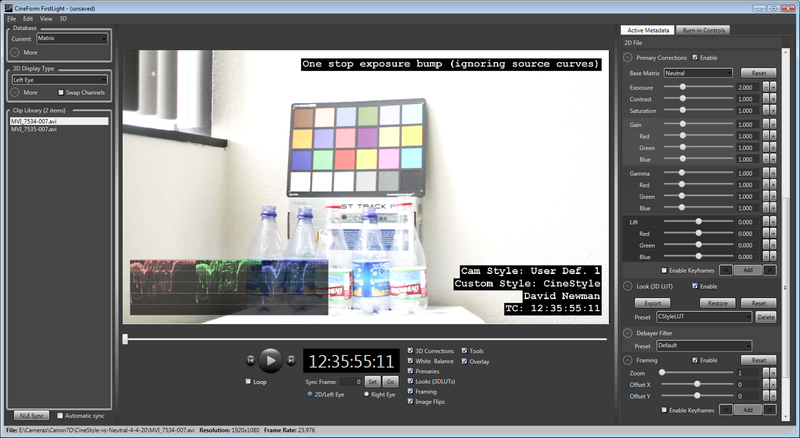 The CStyleLUT is also provided under the Look metadata. The LUT is the last operation in the FirstLight color filter stack, so LUT flat spots will not impact the correct-ability of the source. However we can avoid the LUT completely (useful if you intend further corrections outside of FirstLight) by setting the Output (decode) curve to Video Gamma (or Cineon or S-Log or whatever your workflow uses.) Now the CineStyle is developed to the target output curve*. * this does not use the LUT, rather a continuous curve that models the look without flat spots or bit-depth limitations. Revisiting the exposure example above, these images has been bumped up one stop (Exposure set to 2.0) resulting in two vastly different results. Using CStyle vs ignoring the source curve. Note: non-curve based exposure in FirstLight is simulated as producing this error is not standard operation in the tool. If I used the wrong encode curve, such at "Video Gamma" for a CineStyle source, the results are still wrong, but not quite as wrong as the right image shown here.